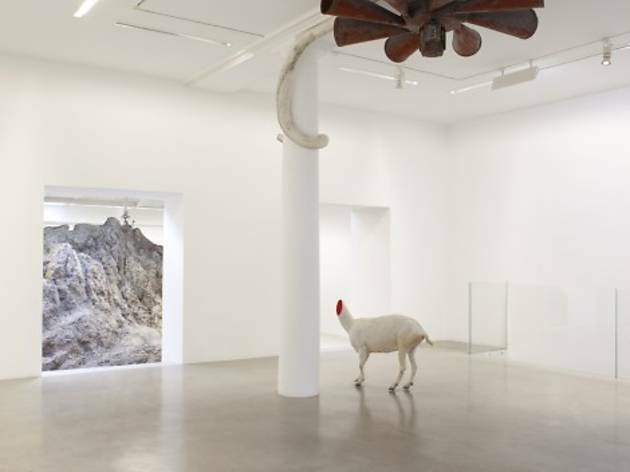 As the Mayan predictions for the end of the world enliven imaginations around the world as to the nature a post-apocalyptic universe, Huang Yong Ping is a step ahead of most. 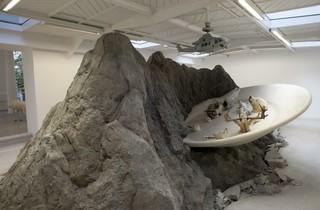 The Chinese artist’s bitterly inventive mind has created an installation at the Kamel Mennour gallery with a vision of Bugarach, a village in the Pyrenees that some – slightly out there – calculations suggest would just escape a global meltdown. Bugarach might have escaped total obliteration, but you still wouldn’t want to live there. 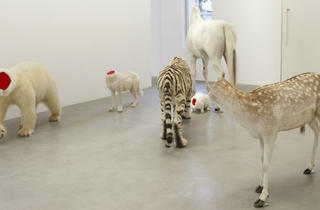 Decapitated tigers, horses, snakes, deer, polar bears and more surround the remainder of the mountainous peak, a rocky eruption from the floor of the gallery. At the rear of this unearthly scree, an enormous plate protrudes from the side of the mountain, a literal flying saucer. 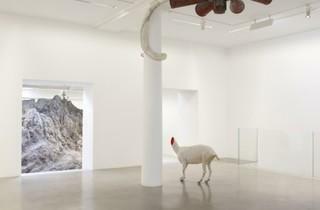 Animal heads are stuck to it, staring at a plastic helicopter suspended from the ceiling, as if hallucinating some post-apocalyptic angel. This absurd farce, full of scorn, is characteristic of Huang Yong Ping’s love of paradox and sharp critical sense – a child of Dadaism, the artist expresses something simultaneously ridiculous, almost burlesque, and extremely violent. There’s nothing rescued here, no all-powerful salvation, nothing but dead skin. The false mythological airs of the scene reference all the great foundational religious myths, and their more violent rites and vacuous theories. 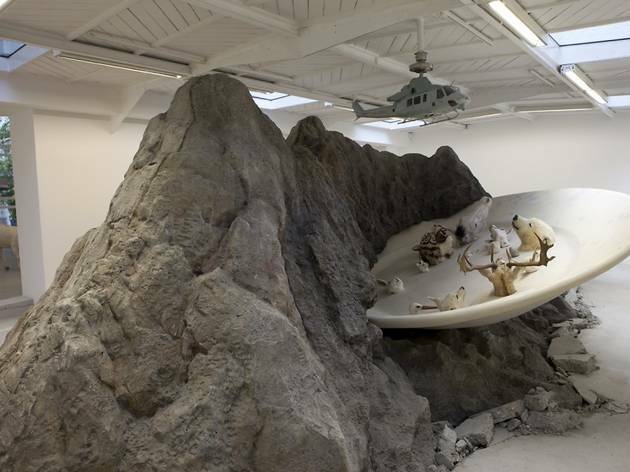 A surrealist collage of discordant elements, ‘Bugarach’ points to a violent, self-destructive destiny for contemporary society.